Thanks man! I removed the master today. Lots of people say they had trouble removing the clip from the clutch pedal. But it came out quick for me. Beginner's luck I guess lol. I'll put everything back together tomorrow. Installed the new master and slave today. Clutch has no resistance, at all. I put the rod on the clutch pedal, and the clip. If I loosen the bleed screw, fluid drips out. Last edited by 1993C4LT1; 04-15-2019 at 05:30 PM. How did you fill the system? Usually best to work from the bottom up...bench bleed the slave, then connect hydraulic line, then replace master. This way ensures little air is Introduced. It may take 50 or so pedal strokes to start feeling resistance. Pump the pedal varying depth of stroke, quickness and hold time. As air is displaced the pedal will get more firm. At first, I bench bled it. But due to my lack of experience on this, the fluid came out. In order for me to get a good angle(to tighten) on the hydraulic line, I had to push the slave against the fork. Thus shooting the fluid out. I filled it from up top. I may have to ask someone that knows how to bleed a system come help me. I tried reverse bleed again. But everytime I do that, it's incredibly hard to pump fluid into the slave. Which results in the line popping off the bleed screw. Yes, I did loosen the bleed screw as well. I do this a lot.. I have this, and a bunch of adapters for it. It is one of those things you use over and over and over and, before you know it, you realize how low the price actually was because of all the time it saved you. Before that, I tried other bleeding tools, schemes, methods, with varying results. The problem with the clutch system is the master is so small it almost syringe like, and it doesn't displace a lot of fluid when you stroke it. And the system is so small, even little bitty "soda fizz" looking bubbles, almost too small to see, can cause major problems. 1) Attach a tube to the bleeder and run it up and over into a container. 2) Get someone to push it down, bleed, release.. Over and over till you get the air out of it. You can tap it lightly at the slave and line with something to help shake the air loose if you like. 3) I would not over work the pedal during this process, because what ends up happening is the formation of those little soda fizz bubbles and they're almost impossible to get out. 4) If it is close? A lot of times you can drive it and it will work the rest of the air out relatively quickly.. Even if you have to pump the clutch once or twice on a stop or start, a short drive usually shows marked improvement. 5) Manual bleeding a clutch takes time.. I have bled them for an hour or two, sometimes.. Just stick with it and you'll get it eventually. Last edited by confab; 04-15-2019 at 08:32 PM. Now that shouldn't be. Reverse bleed it, but first undo the hydraulic line at the clutch master cylinder; fluid should squirt right out of the line when you pump fluid into the slave. If it doesn't, the clutch hose has collapsed internally, or has an internal blockage; which by the look of all the photos and gunk is a possibility. If your clutch hose is original, which it probably is, the factory places a small restriction/ orifice inside the hose to actually slow down the engagement of the clutch. That could be blocked. At this point, especially since you can't fill the slave from the bottom without the line popping off the bleed screw, I'd suspect that some things going on with the hose. Last edited by mtwoolford; 04-15-2019 at 11:20 PM. I've been wondering the same. If I have to replace the line, oh well. I'll check that tomorrow. I had my clutch line rebuilt by a local hydraulic hose shop for cheaper than buying aftermarket one. They made it out of flexible metal and put a nice rubber line around it which is resistant to heat and abrasion. Something to look at. -- Fill the slave cylinder completely full of fluid and bolt it to the bell housing, keeping it as full as possible. -- Attach the line to the slave cylinder. It may be necessary to put some fluid in the line before attaching it to the slave in order to ensure minimal air in the system. This might make a small mess while connecting the line to the slave, just keep some rags handy. -- At this point, the slave should full of fluid with minimal air, if any. 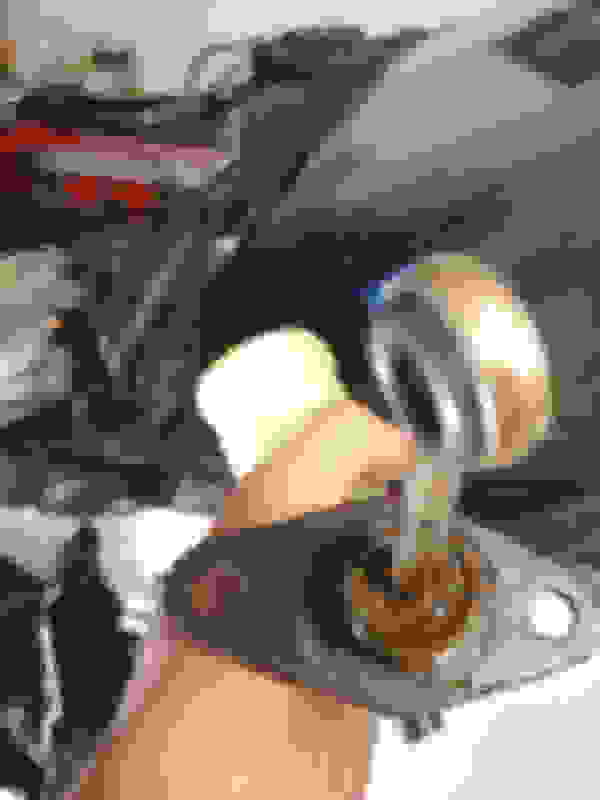 -- Slowly / carefully add fluid to the top end of the line, running it down the inside wall so the fluid fills the line. -- With the master cylinder full of fluid and the cap on the master, sit in the car and press the clutch pedal to the floor and HOLD IT THERE. This should be the first time you have touched the pedal during this procedure. -- After about 3-4 minutes holding the clutch down, side-step the clutch pedal, letting it snap back up. I realize there may be little pressure holding in the system and the pedal might not exactly snap up. Repeat this "hold and snap" with the clutch pedal several times and it should build pressure and work out any air trapped in the system. -- It might be helpful to bleed some of the fluid in case a bit of air got trapped inside the slave. -- Check the master and top-up fluid as necessary. -- A bit tedious but it worked for me. -- Hope this helps you. Checked that earlier this morning. First, I took the 2 nuts off the slave. To make sure the slave rod was on the clutch fork's divet. It was. Bolted it back up. Drained the fluid through the bleed screw. Loosened the hydraulic line on the master, completely and pulled the line out of the master. Moved it over to side. Then, attempted a reverse bleed. Again, it was hard to pump. So I loosened the screw more. It was loose enough to where fluid was dripping from the highest point of the threads on the bleed screw. It is only somewhat easy to pump fluid through, with the bleed screw that loose. Anyways, fluid did come out of the line by the master. IMO, I shouldn't have to loosen the bleed screw that much. But I could be wrong. wrap the threads of the bleeder screw (and only the threads) with some Teflon tape for threaded pipe fittings, usually about a $1.00 a roll at the local "Home Despot" outlet. I'd still pull the hose and make sure its not obstructed or collapsed. If fluids coming out by the master, (minus any air that might have been entrained with the new fluid during filling), the system should be full of fluid and air free. Got any pedal yet? Last edited by mtwoolford; 04-16-2019 at 05:32 PM. What brand clutch master cylinder did you buy? Wagner. It was the only one available on rock auto. Ordered a new clutch line today, through zip corvette.